With the growth of the telegraph in the latter half of the 19th century, telegraphers began to experience a phenomenon known as "glass arm", which was a paralysis of the wrist from the constant up & down motion of operating a telegraph key the whole day. This disorder is better known today as Carpal Tunnel Syndrome. In 1902 Horace Martin invented a unique instrument to combat the problem of glass arm. Instead of an up/down motion, the keying lever on his instrument went from side to side, and more importantly, it used a battery powered interrupter circuit to allow the instrument to make dots automatically simply by holding the lever to the right. This greatly lessened the tension on the operator's wrist. He called his invention The Autoplex, and it went into use in 1902. (See the Martin Autoplex Patent here). 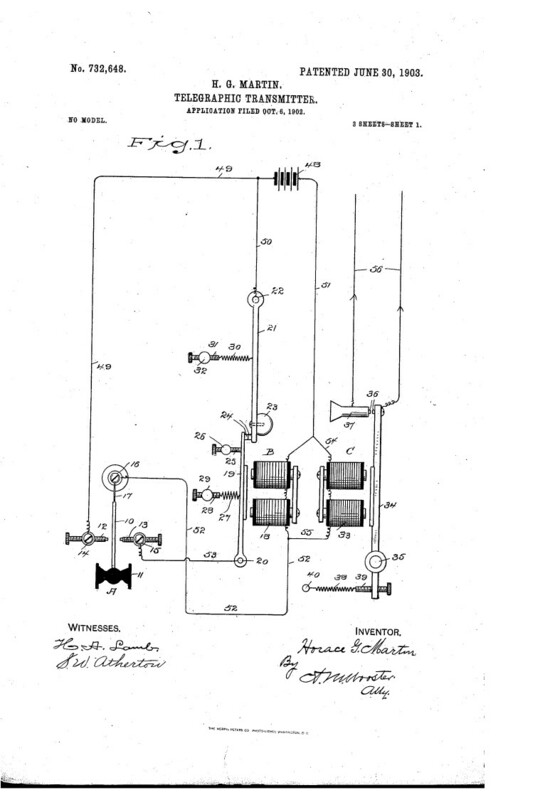 Soon after his Autoplex invention, he came up with an improvement to his telegraph key that eliminated the need for a battery, as well as the electromagnets and other complexities. Instead, the dots were produced by a mechanical oscillation of the horizontal lever striking a fixed post. Unlike the Autoplex, this new key, which he called The Vibroplex, could only produce about 10 dots or so before the oscillations subsided. But a telegrapher does not need to send that many dots in one sequence, so the new Vibroplex design accomplished its goal just fine. Obviously The Vibroplex revolutionized telegraphy, and many other makers developed their own knock-offs of The Vibroplex, resulting in numerous lawsuits by Horace Martin and his partner JE Albright. You can read more on this topic in Bill Holly's book titled "The Vibroplex Company", available from The Vibroplex Company. Click on the links to the left to see pictures of different bugs. The first link for Vibroplex has pictures of the Autoplex as well as the other different models. There are also links to other bug makers' instruments as well as bugs from all around the world !